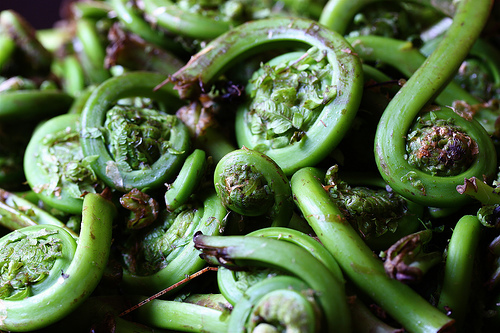 It’s spring and I again have an unbelievable craving for fiddleheads. I haven’t had any since I lived in Maine which was several years ago. There they weren’t as “odd” an ingredient cuz I could just drive up to the Hannaford up the road and get them. It might be a cultural phenomenon, which I think is due to the large French influence in the area (Quebec is just north of Maine), and I have found several rustic French recipes that use them, usually from Northern France. That region is a lot more similar in climate to Maine and Quebec so that could explain the regional popularity of them; similar climate, similar flora. It’s that whole work-with-what-the-land-gives-you kind of thing. I am not a horticultural anthropologist, so who knows if it’s true, but it makes sense to me. Apparently these all come from the ostrich fern. For those who don’t know, fiddleheads are the immature shoot from the fern. Now do not go and just start harvesting some ferns from your backyard. Some ferns are toxic to eat at any developmental stage and if you don’t know what you are doing you could be making a big mistake. Which is why I just try to scour the markets for them. I did find them once at a market in downtown Ann Arbor, but they were not in good condition. The season for them is very very short keep an eye out for them. That’s probably why there are a lot of pickling recipes out there. The University of Maine does have a page of info that you should check out. It’s hard to describe the taste. I’d say it’s a cross between asparagus and mushroom. Not like a button mushroom, but more earthy from like a woodland mushroom or morel. It’s a very delicate flavor, which could be easily overpowered. So recipes tend to be fairly simple with few ingredients. 1. Melt the butter in a saute pan with the oil over medium heat. 2. Add the shallot and cook until tender and opaque, about 2 minutes. Throw in the garlic and saute until the garlic perfumes the dish, maybe 1 minute. 3. Add the fiddleheads and cook for about 3-5 minutes. Add the salt and pepper and toss. Cook for another 3-5 minutes until tender. 4. Sprinkle on your fresh dill and serve. Again, it has been a long time since I made this so the timing might be a little off. I still am having some difficulty finding some fiddleheads here. But I am trying to encourage folks to try something that they might not consider. Expanding your horizons can be delicious! This entry was posted in Culture, Recipe, Sides and Appetizers, Vegetarian and tagged Culture, Recipes, Sides and Appetizers, Vegetarian. This recipe looks delicious! I, too, am from Maine and ate them growing up. What I find so hard to stomach are the prices they charge outside of Maine – I saw some once that were almost $20 per pound, and they looked to be of pretty poor quality. thanks for stopping by! the price for the ones that i found here were ridiculous too. like $18 a pound. i need to check to local farmer’s markets again to see if anyone has any. i tried asking around once before and people thought i was off my rocker. might try local restaurants to see if they know of any resources. a nice olive oil sounds good. should work well since the cooking temperature isn’t high. and removing the butter makes the dish vegan!